Nearly 1 million total knee replacement procedures are performed in the U.S. each year and that number is expected to continue rising exponentially to over 3 million in the next 15 years! So it comes as no surprise that the most common joint replacement procedure Physical Therapists rehab in the outpatient clinic is a total knee arthroplasty or total knee replacement. Many candidates want to know what to expect after a total knee replacement before they choose to have the surgery. 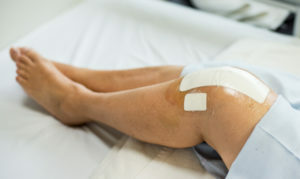 Patients usually elect to have this procedure after nonoperative treatment options or knee replacement alternative surgeries fail to maintain knee function and pain levels. 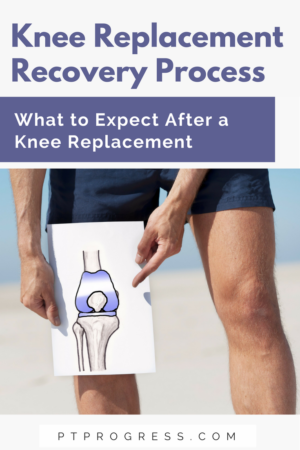 For those patients that do decide to have total knee surgery, keep reading to learn more about the total knee replacement recovery process. Typically a patient’s knee will be swollen, stiff, weak, and sore following surgery. This makes functional activities such as walking and standing up difficult to perform. The timeline for regaining strength and range of motion after knee replacement is variable. These two elements are key to successfully completing the total knee replacement recovery process. The timeline for recovering varies from patient to patient, but typically the rehabilitation process takes 10-12 weeks of therapy to reach goals of achieving range of motion, strength, and performing functional activities such as standing from sitting, walking, and climbing up/down stairs independently – without difficulty or pain. The start of rehabilitation begins in the hospital soon after surgery. Pain levels, range of motion, and strength will be monitored to ensure progress is being made. Transferring in/out of a vehicle – since you’re not walking home! Discharging home depends on the status of a patient’s knee healing, flexibility, and strength. Patients are often provided with basic, but important beginner exercises to perform while in bed for regaining the necessary straightening (extension) and bending (flexion) of the knee, as well as early mobility to prevent blood clots. Patients and family will also be educated on managing swelling, pain, and monitoring the incision site for bleeding, blood clots, or infection. Blood clots can cause lower leg pain at rest in the calf area that is unrelated to the incision site itself and can cause increased swelling below the knee that is painful in the calf, ankle, and foot. Sitting still after surgery can create an environment for blood clots, so performing exercises while sitting or lying down is better than nothing. Signs of infection include severe pain with or without activity and abnormal redness, tenderness and increased drainage at the incision sight. Replacement and incision healing routinely. These are important for ensuring a patient is safe to go home. The majority of patients meet these requirements and will be out of the hospital within 1-3 days. If a patient has delayed healing or limited support at home, they may be a candidate to be transferred to a skilled nursing facility or rehabilitation hospital for 1-2 weeks for further recovery. It would be nice if a knee replacement was like getting a new car part installed and away you go. The surgery is just the beginning of the knee rehabilitation process. Swelling, stiffness, and strength are necessary to improve in order to decrease pain and progress therapy to higher level activities. They will be the primary focus of therapy early on to set up the patient for successful rehabilitation. It will take time for the knee tissues to heal and gradual loading to improve strength and flexibility. Leg swelling is going to be present after having a knee replaced. Swelling has a significant effect on knee flexibility and the ability for muscles to contract. Think of trying to roll up a full water hose versus an empty water hose. It is important to monitor, limit, and attempt to reduce swelling as much as possible. Laying down with the surgical leg straight and elevated above the level of the heart with an ice pack for 20 minutes of every hour. A compression and cold therapy unit such as GameReady, Squid Compression, or Cryocuff may help to limit and reduce swelling. Performing ankle pumps, knee bending and straightening, and moving the hip in all directions every 20-30 minutes will prevent having too sedentary of an environment. Avoiding having knee in a gravity dependent position or below the level of the heart for too long (i.e. standing or sitting still for prolonged periods). Wearing appropriate fitting compression stockings or socks may aid in reducing swelling as well. It is also important to continue monitoring for blood clots and infection, as sometimes the onset of symptoms is delayed and requires immediate medical attention, possibly rehospitalization. Knee swelling will limit knee flexibility, but there is also healing and scarring of tissues to consider that will prevent a knee from bending and straightening. Patients need to slowly improve their flexibility so their knee does not heal stiff, but at the same time not push too much that they are aggravating the recovery and causing more swelling. The “normal” knee range of motion is 0 degrees of knee extension (straight) to 135 degrees of knee flexion (fully bent). It is not unusual for someone to have 5-10 degrees of hyperextension and knee flexion varies anywhere from 120-150 degrees. The expected range of motion after knee replacement is 0 degrees of knee extension to at least 115 degrees of flexion or greater, but this can take several weeks or months to achieve. Starting out, the goal is to get the knee to bend to 90 degrees within the first week and then improve 5 to 10 degrees each week after that until full flexion is reached. Again, this timeline is variable from patient to patient. It is important to achieve full knee extension for walking to feel more natural and have less knee pain. If you don’t achieve full extension, it will feel like you’re walking with 1 leg shorter than the other. Strengthening after a knee replacement is just as important as managing swelling and regaining knee range of motion. After surgery, a physical therapist will guide each patient through total knee replacement exercises. Having a PT provide guidance will be helpful as it can be difficult to engage the muscles of the leg in order to achieve the motion into flexion and extension. As mentioned above, the motion of extension (straightening the knee) and flexion (bending the knee) will be a focus early on with the rehab process. Below is an outline of the exercises you can expect to perform during Physical Therapy. Some patients will use a continuous passive movement (CPM) machine that will repeatedly assist bending and straightening your knee slowly for hours each day for a couple weeks until they have reached a desired range of motion. As previously mentioned, walking after knee surgery will likely begin the day of or day after surgery in the hospital with a walker or cane. The amount of weight put on the surgical leg is usually as much as tolerated, so using the walker and taking smaller steps can help offload a painful knee. The goal of walking early is to prevent muscles from weakening and to get the knee moving in a normal gait pattern again. Patients that are hesitant to walk or use the walker as a “crutch” for too long can also delay the recovery process. This goes back to the “as tolerated” concept. If you can tolerate walking without a walker, then walking starts with short bouts until longer distances are comfortable. When Can I Stop Using a Cane after Knee Replacement? Within two weeks of surgery, some patients may walk without any device in the morning, but become tired in the afternoon and need the device again. The same concept applies to changing surfaces (carpet, tile, grass, pavement), inclines, or steps. It may be easier to walk in the house on a firm and predictable surface without a cane or walker, but going outside on uneven and unpredictable ground would be safer with an assistive device. On the other hand, walking without a limp while using a walker will be necessary before moving on to walking with a cane or no assistive device at all. Tossing the walker or cane to the closet too soon can cause delayed recovery and possibly not regain a normal gait pattern. Almost every PT has had a “strong-opinionated” patient that chose to walk without a walker or cane before the therapist was in agreement and had less successful outcomes in terms of their walking abilities. It is highly recommended that an assistive device is used for as long as needed to achieve the required strength, flexibility, and gait pattern. This process requires patience and understanding from the patient that every surgery and recovery is different. This means that even though someone they know was walking without a walker after surgery before they are that they are not necessarily behind. There are several different conservative or less invasive options that may be attempted prior to having a total knee replacement. Injections are often used in an attempt to decrease inflammation, friction, and pain in the joint. Surgical options to consider aim to preserve or restructure remaining tissue and to prevent or put off a total knee replacement. Physical Therapists provide non-invasive treatment options to improve strength, flexibility, and body mechanics for functional activities to reduce knee pain. PTs can also educate patients on an exercise program for improving body composition. As a Physical Therapist, I’ve seen firsthand the significant improvements in people following a knee replacement. However, there is no surgeon or PT out there who can 100% guarantee success. There certainly are risks following a surgery and this should be discussed with your doctor. But just as important, you should discuss the expected outcomes with your physician. Returning to activities such as walking, golf, bowling, swimming, light dancing, and even light tennis is usually encouraged. However, ask your doctor about suggested timeframes for these activities. Knee replacements have come a long way in the past 20 years and the technology continues to improve. Set your expectations appropriately with your physician and therapist. Here’s to hoping your life after knee surgery is full of enjoyment and activity! My dad has to get knee surgery soon, and he is wondering what to expect after surgery. That is good to know that the timeline for regaining strength and range of motion will be different for everyone, but usually takes around 10-12 weeks. That isn’t too long. I think my dad will be fine. Thank you for all the information about what will happen after his surgery. Let your dad know it’s painful after surgery! Everyone told me you’ll love your new knee…NO ONE said there is pain for the first month! The physical therapy is no joke!! It’s a lot of work, and very important to get your extension and flexion to the best possible range. I wish I would have known this. Every time I stand or walk while working I find it hard to get out of my car and my knees seems to be very heavy when I get home. I am at ten weeks post surgery I am afraid I have blood clots. Is this pain normal? 11 weeks post op. My knees feel very heavy. How long does this last? I had both knees done at the same time. No pain at all they just feel heavy. I am very glad you had no pain and would like to know how. MINE WAS AND is still painful. June 4th will be 4 weeks from TKR – doing outpatient PT now – I’ve been walking without aid of cane/walker 10 days after TKR – ROM is slowly getting there – overall I’m very pleased. I’m a 5’11 190lb 75yr old former runner (42 yrs). Great to hear Gary! I hope you’re feeling great now! The biggest thing I found was that you have to control the pain so you can do the exercises. If you don’t then you won’t put the effort needed to exercise and then that’s when problems happen. I’m walking fine just at eight weeks. I will be have. Knee surgery soon.Thank for the information. Good Luck! Work hard and you’ll do great! Going for tkr in a few days. This article has been very helpful to put concerns aside. Thank you. Great insight Susan! It’s true, everyone’s recovery is different and you’ve shared some great insights on your journey so far. Thanks for taking the time to read the article and to share your story! Thanks for commenting and sharing your situation. What were your expectations for the surgery? If you had been using a walker for the past 3 years due to the stroke, a total knee replacement isn’t going to change the residual effects of a stroke. In general, a knee will continue to change for an entire year following a TKR. The swelling can continue to fluctuate for an entire year. Had a TKR On 3/6/18 (right knee) and am doing very well. Walk with a cane outside. PT 3x a week and am up to 103 degrees of flexion. However, this is the antithesis of what happened last year with my left knee. Horrible swelling and pain. Took 13 weeks to recover well enough to return to work. I believe the reason to be that I waited too long bf I had the surgery. My left knee was in terrible shape by the time I had surgery. I decided to do the right one now bc it was in better shape and as I’ve been told numerous times, “no two knees are alike”. Luckily, that is true in my case. My recovery is surprising but certainly welcomed after my history. Hard work, diligent exercises and time are the keys. I wish all here the very best. I had a knee replacement on Oct 12, 2017. I was walking on uneven ground and afterwards have a searing pain on the side of my knee. It still hurts after two days. Should I only be walking on paved surfaces from now on? I didn’t know that bumpy ground would cause knee pain. Thanks. That’s a good question Addie. Walking on uneven surfaces is no doubt more difficult due to the challenge of balance and instability many people have after a total joint replacement. The good news is that balance and stability can be improved with practice, so a gradual re-introduction to this type of activity may be beneficial. Walking on a paved surface may be the best option for people who have just had a total joint replacement. Progressing into a more challenging terrain is possible, but should be done gradually. Encouraged to finally read a comment about the condition of the joint before surgery. I had my TKR almost 9 weeks ago and have been very dilligent about exercise, icing, Rx, etc., yet it has been a real struggle for every degree of ROM. Specifically, I have just reached 110 flexion (gaining about 5*/week) and seem to be stuck at 5* extension. Very frustrating, to say the least! Especially when I see others at the physio clinic doing so much better (and so much sooner)! I am 65, have a BMI under 26, spent 12 months of ‘prehab’ before the surgery and underwent a hip replacement (same side) 15 months before the TKR. HOWEVER, I ruptured my PCL 25 years ago, and was diagnosed with osteoarthritis more than 15 years ago. For a variety of reasons, I waited so long for this TKR that the knee and its surrounding structures were in horrible condition for many years BEFORE the surgery. Nobody ever suggested that I should be prepared for a slower and, therefore, longer recovery due to my condition before the surgery. I think practitioners would be wise to warn patients that not only will rehab be a demanding and painful process, but it might well be slower if one has lived with knee disfunction for many years prior to replacement. My aim is for a minimum ROM of 125 by 6 months and I will keep working to get there and stay active to keep it. I had a tkr on May 22 2018 I was delayed getting physio for 2 weeks due to medical issues. Now I am in rehab. I still have some swelling and bruising in the knee and struggling to get range of motion. I left hospital after 2 days and had a 80 degree bend. Little physio in hospital and surgeon had told me before surgery he expected his patients to have a 90 degree bend so this was not a good start for me as I was feeling a bit disappointed. My surgeon had said their would be a lot of pain but I was not expecting so much swelling and bruising in my thigh, knee, ankle and down the side of my leg. It does take patience a lot of patience and physio in clinic and at home. I hope you’re feeling better since your TKA. It is common to have bruising as you’ve described. The swelling can really make it difficult to achieve a 90 degree ‘bend’ or flexion of your knee. I’d be interested to hear how you are doing now. Hope you are well. For those of you considering a bilateral total knee replacement here are some observations I have made at day 6 of recovery. You need to be in good physical shape before attempting it, expect what I was told and have experienced – greater total pain, less mobility at first since you don’t have a “good leg” to help you, and a post operative feeling of “what the heck what I was thinking?” when I asked for a bilateral. Days 1-4 1/2 were real rough. Day 4 1/2 became more tolerable and now in day 6 I see hope! There was too much pain for the first three days for barely any mobility exercises but am into them now and have about 80 degree ROM. I look upon my recovery program as my job and have no illusions about the tough road ahead. At this point I think that really the main difference between one knee or both knee replacements is the increased demands placed upon your caregiver for a bilateral for reasons stated above. I also managed to somehow come home with a UTI which I have never had before. Actually there is one advantage of having a UTI at this stage – I have no choice but to frequently get up and using the walker, go the bathroom thus exercising the knees rather than staying too long in bed or the recliner before getting up. Hope these observations help those of you contemplating a bilateral. Hi Karen – hope you get this message. I’m also quite overweight, and had a TKR eight weeks ago. I’ve had an exceptionally good recovery, which I attribute to my surgeon’s skill, my exceptionally strong leg muscles, a high pain threshold, and a fair bit of determination. I would say the best thing you can do at this point is to work really hard on strengthening your quads & hamstrings, since they will be important in supporting the new knee, and your entire body, after surgery. If you can get to a gym, you’ll be able to get specific information on strengthening those muscles. My other knee will be done approx. 6 months after the first one, which seems a reasonable period of time for the first knee to be fully stable and able to support me while the second knee recovers. Try not to be afraid – this is a really positive thing that you are doing for yourself, and once you are pain-free and mobile, you’ll be better able to deal with weight loss issues. Best of luck to you!!! I am also heavy, but I exercised with heavy weights and did cardio 4-5 days a week 1.5 years before surgery and got more heavy tho to muscles. I had total kneereplacement in both knees at the same time. My surgeon meant that i was physical and mentally strong enough to handle it. Day 8 i went back to the gym and in week 12 i went hiking twice in 5 days . My bend was at 135 week 8 and i been doing my exercise 4 times a day until week 12. I had no fysioterapi and i’ve been taking care of all the rehabilitation on my own. Today it’s 5 month ago and i’m doing fine. Still in pain and stiff but hey, i can walk again and go hiking. Hiking is my passion in life and i love it! And i’m only 44 years old and i have had problems with my right knee since i was an elite swimmer at the age of 16 and I’ve been doing kickboxing for many years in until the age of 32. That’s when my knee got realy bad. Unfortunately my left knee ended up being the worst knee 🙁 But here i am doing what i love the most thanks to two new knees! I am at odds with the physio who is measuring my knee flexion post KRS. She insists that I am sitting on a chair with my whole foot on the floor and that I slide that back towards me. When I cannot do so without lifting my heel off the floor that is my maximum knee flexion. I used to be a rehab PT and my understanding is that you do not measure flexion of a joint when evolving TWO joints (in this case the flexion of the knee and dorsi-flexion at the ankle). For example if my ankle was injured and locked at 90deg to the tibia, because I could not lift my heel off the ground it would appear that my knee would have very little flexion at all! After discussions with the surgeons and the senior physiotherapists they have confirmed that the methodology used as I reported was incorrectly applied. The individuals involved had mistakenly used a measure for early post-operational flexion (when flexion is extremely limited) and applied it to later stages in the treatment cycle when there was, in fact, much more flexion. The result of this was that the degree of knee flexion was under-reported, giving the impression that recovery was slower and extended physio treatment. This has now been corrected. It’s common to feel the prosthesis (the new knee) move a little or make small clicking noises. Nearly every TKA I feel will have a small amount of give to it that may feel like it’s ‘moving’ as you’ve described. As your muscles become stronger, the knee should feel more stable with those activities. Had total knee replacement 6 weeks ago and I can say I am now feeling better. I am 71 and I also am heavy. The first 2 weeks are the hardest with pain but from word go I did very good with walking. I will say I don’t like pain meds so I think I had more pain because I would only take meds when needed and I was wrong about that..I only had 4 weeks of therapy and was released with ROM at 110. I do the therapy at home 2 times a day and I don’t fudge on this..i am religious about that…I had trouble sleeping for the first 3 weeks but that also is getting better. When back to work in 3 weeks no drove car in 2 weeks. So all in all I am glad I had it done so far…I need the other one done also but I will wait for about 6 months.. Thanks for sharing your experience here Cathy! Glad to hear that you’re doing well. All the best! yes my doctor say that recover within 8-10 months but i need more time above 1 years don’t know why, i think for my eating habit. and for that still now i fell some pain when i walk so much. i take continue medicine from my doctor prescription. hope it will be fine within months. but thanks for sharing your great article. I had TKR on my right knee on September 24th which was about 10 days ago. I had the left done about 8 years ago so I knew what I was in for as far as recovery; then it was about 6 months for me to have no lingering discomfort. For this procedure (now at 10 days), I’ve had a PT evaluations and two sessions. Needless to say, the sessions were heavy duty and I was pretty exhausted at the end. After the second session which went well, I suddenly had a break through and was not as sore. The calf muscles and tendons seem to be taking the brunt of the load but with ice and a lot of at-home follow-up stretching and am moving along and looking forward to getting a few days of rest (I’ll still work at home on key exercises). I am pretty well over needing the walker but will not switch to a cane until instructed. One thing I had not counted on was the fatigue. It seems that 4 hours of activity in the Am and it is time for a nap. Then some afternoon activities and a nap before dinner. Are other experiencing this? I do ice several times a day, wear my compression sock, and find myself unconsciously doing leg and knee stretches and I watch TV. There seems to be a decrease in swelling but the fatigue was a surprise. PS I’m just about off all serious painkillers and just use acetaminophen as required. I’ve had five knee replacements on right knee. I rode from Chicago to DC, my knee feels like post op surgery pain. It’s stiff and painful to stand. I got to ride back to Chicago on Sunday. Feedback greatly appreciated. Thank you in advance. Thank you for sharing this article. Hope it might be much useful for us. keep on updating !! Im having tnt on 15th all my pain is in back if knee banker cyst they say its because knee has bad arthritis bone spurs will cyste go away after New knee? I’m having my right knee replaced on January 16th and I live a lone. I just moved to my new location and I don’t know anyone here. It’s scary and just wondering if anyone knows the time line to return to work if you walk all day and do have to do lifting? Very thorough post, it points out every single point of knee replacement surgery recovery. Initially, i has several questions but now i am very crystal clear with every thing. Thank you writing this post. I had tkr 9 weeks ago I am only taking ibuprofen for pain. I can be on my feet all day and do anything I want but I get tired. My problem is my range of motion is only 123. I had more prior to surgery. I still go to PT and exercise. Will I gain more or is this it? I had TKR on 9 Jan this year. Since that time, I have a manipulation due to a stiff knee. I work hard at home on my exercises and never miss PT. Today, my flexion was 85. It keeps going up, but I guess it takes time and more time. I agree with Teresa, everyone said it’s great, you’ll love it….but no one said how painful it was in the beginning. I had my TKR 7 weeks ago and I cannot imagine having the other knee done. Maybe later on I may but now the pain is still too fresh to consider it. I had TKR on March 5, 2019. I was released to go home on March 8, 2019. Home Health came on Sunday, and the workout was so rough that it took me until Tuesday to recover. Another PT came yesterday, and said my knee should bend 90 degrees by now, and pushed my leg back so far that my knee swelled and now I can hardly move it. I also have fibromyalgia, and osteoarthritis. Both hips have been replaced, and my other knee needs to be replaced. I’m 74, somewhat overweight, but was active before this surgery. Any advice? I’m discouraged! I had bilateral tkr at the end of December (2018). For those concerned with pain, swelling, and rom, my advice is to do absolutely everything you can from minute 1 to gain as much extension AND flexion as possible. Move those knees. I gained 140 and 0 very early on. Ice as often as you need. There is so much soft tissue damage that it will take time for pain and swelling to go down. Look for small improvements each day. It does get better. I made daily notes about my sleep, medications, activity, and thoughts so that I could look back and see my progress. on the ahead with surgery on my rt knee with this condition, or wait until the rt knee is in better shape?